- Thanks to all our members and elected officials for making this a 1st-Class Bonsai Society! 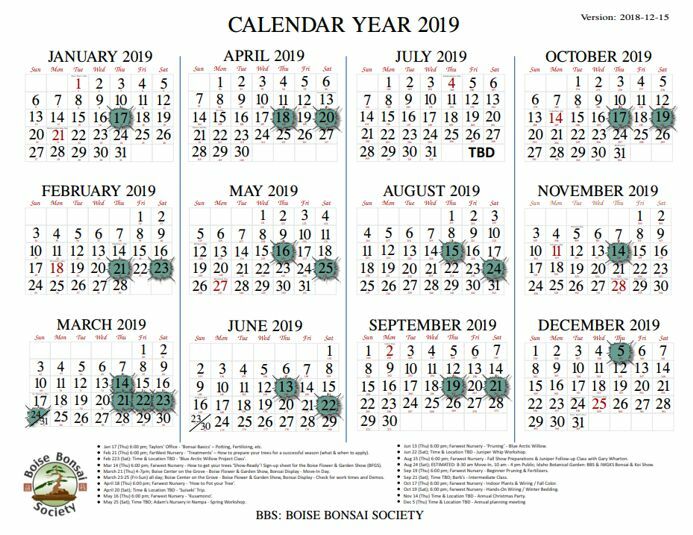 2019 Calendars: Updated as of 2019-01-19. Peruse Photos from our most recent 2019 Annual Spring Bonsai Display at the Boise Flower and Garden Show! How to Pot your Trees! Come learn how to increase your chances of success when pruning and repotting those roots! Bring your Blue Arctic Willows! Location: Private Home. Please refer to distroed email or private Facebook Page for address, or contact leadership. Caution: Keep your trees in a protected environment, if working early in the season. Bring your trees out of winter ground protection. Potting: This is the time to trim roots, pot, or repot trees (do not fertilize newly potted trees for 4-6 weeks). Pruning: Prune all deciduous trees. Prune flowering trees after they bloom. Potting Demo, 15 FEB 2018. Peruse all our photos on our 'Galleries' Page. 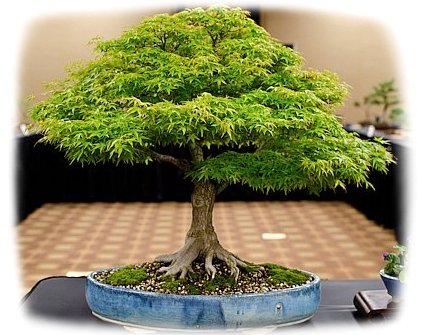 The Boise Bonsai Society (BBS) is a group of dedicated bonsai enthusiasts from the greater Boise, Idaho area. Our goal is to educate both our members and the general public in the art form known as 'Bonsai' (pronounced 'bone-sigh'), the ancient Asian art of growing miniature trees in pots. Our club holds bonsai workshops, collecting trips, and annual shows throughout the year. All levels of ability are welcome! 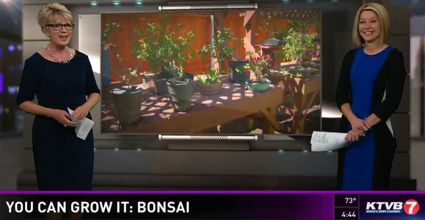 * News Media Coverage: The Boise Bonsai Society leadership was recently interviewed by KTVB, NewsChannel 7, and aired 26-28 May 2016 on "You can grow it with Jim Duthie". You can watch the full segment by selecting the video image below and waiting for the advertisement to complete. The top of the tree reflects the base; finer soil equals finer roots, which equals finer branching (or ramification). Goal of good soil is to produce the right mixture of water & air. In our climate, we use the 'Boon' mixture (named after a Master in California): 1/3 Akadama, pumice, & grit. Repot a mature tree about every 5-7 years. Use aluminum wire on deciduous trees. Look at the flare at the base of the tree. Remove or reposition crossing roots. Keep some of the original soil, as it contains very valuable 'Mycorrhizal fungi'. Already fertilizing with 5-5-5 Dr. Earth fertilizer. For deciduous trees, use 1 scoop Bone mix & 1 scoop Akadama. Lay down a thin layer of larger particles first, then use smaller particles above that and around roots. When securing tree, you may need to use a chop-stick to borrow a hole for the wire. Pull, then twist wire when securing. For top-dressing, use grated orchid moss, mixed with water, india ink, and some live yard moss. When dried, sprinkle over the top layer of soil. This top-dressing encourages moisture toward the surface, and encourages fine roots at the top layer. We had a very good Annual Planning Meeting this year, and our new 2018 Schedule of Events is now posted, as of 2017-12-09. 2018 should be full of great events, so please plan and look forward to more details as the year progresses. We had a great time at our annual holiday dinner this year! Lots of fun, gifts, food, and fantastic fellowship. Thanks to all of our officers for all your work putting this great event together again this year, and for making it so much fun for all! Members, please don't forget to attend our next annual planning meeting, to help us make next year another exciting success! Winter Beds - Download the Guide Here! We saw some beautiful fall-color specimens this meeting, shown by their owners. Thank you for sharing! Use no-nitrogen fertilizers every 4 weeks this time of year. Rapeseed balls for Junipers and Firs. Kelp meal - sprinkle on surface. Use doubled up terracotta pots for cuttings. An inexpensive substitute for Akadama is 'Spill cleanup' or cheap cat litter. Granite - a little more acidic. Large, plastic pot alternatives can be found at Fred Meyer - they include one large drainage hole. Can obtain from WoodCraft; use matt finish. Bondo has a product that repairs dry rot. Vasoline can be used for cut-wound sealing, or petroleum jelly. Easy to put on the end of a chop-stick. Tool Talk - Download the Handout Here! Fertilize right out of the ground, March through June or July. Do not fertilize right after repotting - allow 4-6 weeks for roots to recover. Apply iron to Pines & Junipers to green them up. Sumo Cakes (4.5, 4.5, 4.5) - https://www.sumocakes.com. Rapeseed Fertilizer Cakes (5, 2, 1) - Stone Lantern Rapeseed. GreenDream Fertilizer Cakes (7, 5, 5) - Stone Lantern Green Dream. Dyno-gro Fertilizer (7, 9, 5) - Stone Lantern Dyno-gro Bonsai Pro. Fish Emulsion (5, 1, 1) - Walmart Alaska Fish Emulsion Plant Food. Best to wire in Summer and Fall; not in Spring. Best time to repot evergreens is in June/July, after foliage is very strong; evergreen strength is in the foliage. When pruning Maples, always seal wounds. Maple wounds dry out and die back very easily; they also allow for infection. Demonstration on cleaning pots to prepare for display. 'Bar Keepers Friend' cleaning product can help clean stubborn hard-water stains from pots, etc. - Walmart Bar Keepers Friend. 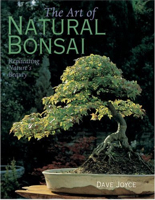 "The Art of Natural Bonsai..."
This is a great website, especially for new members. 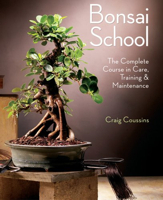 Bonsai: (Pronounced 'bone-sigh') The art of growing trees in trays or pots. 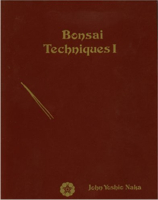 Derived from 'bon', meaning 'tray' and 'sai', meaning 'tree' (Pessey & Samson, 1992, "Bonsai Basics", p16). Besaki: Beautiful Stone; used in formal display. Viewing Stones offer a story and serve as companions to the Bonsai in formal display. Kusamono: Companion Plant; used in formal display. Mycorrhizal: Fungal associations between plant roots and beneficial fungi. The fungi effectively extend the root area of plants and are extremely important to most plants. Original soil contains this beneificial fungi close to the roots; care should be taken whe repotting, to maintain a good portion of this resource. Nebari: Exposed surface roots, located at the base of the tree. Ramification: The training and development of secondary branch structure from the main branches by regular pruning, encouraging thick foliage and pad-development. Schefflera: The 'Indestructable Bonsai'. A popular in-door/tropical species of tree used in Bonsai. 'Dwarf' variety of the full-sized Brassaia. Suiseki: Companion Stone; used in formal display. Note, the word 'stone' is used in Bonsai terminology; not 'rock'. Yamadori: Wild trees collected for training as Bonsai.